Address: 715600, Kyrgyz Republic, Jalal-Abad city. Jalal-Abad State University, the center of cultural, aesthetic, February 24, 2017 meeting of the Scientific Council of the walnuts No.5 organized on the basis of Order No.56. Its activities walnuts educational work of the law “On education”, the successor of the charter, and other legal and regulatory acts and regulations. The main objective of the center, the university students, cultural and aesthetic values ​​involving navigation and youth, cultural, aesthetic, and cultural competency in providing opportunities for the development and creative development. Methodology: The University of cultural events, festivals, celebrations, anniversaries, conducting scenario analysis and methodical support. Arrangement: academic level, organizes cultural events and activities (Festivals, contests, traditional thematic and theatrical performances, concerts, etc.). Artistic creation: creative socio-cultural environment, the university, the students’ artistic and aesthetic requirements, the implementation of priorities and promote development. Among university students and young creative and talented search talanttuların disciplined, growth-oriented. Education: culture, arts and other fields, will organize meetings with prominent personalities and events of interest. Shaimkulov the local Abdullaeviç – hareograf, dance, leading specialist, head of the center. Crazy Crazy Sabırjanovna – Jalal-Abad province Tynybekov best artist of the Philharmonic, the culture, the Epic M.Ömürkanova Award winner, singer and harp on the leading specialist. 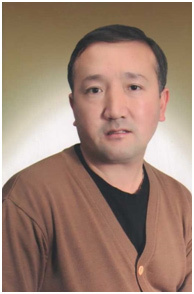 Masaitov Jusupaalı Nirdinoviç – composer, performer, and the best of the culture of the Kyrgyz Republic is the leading vocal specialist.